I am a big proponent of the theory that on any given day, there's a best possible flight to be flown on this island. I've made it my mission to test that theory over the last 18 years. I may not personally fly that best flight, but I try to get myself into the air where conditions are best and participate in some way! On days when time permits (which for me is most of them), I believe it's worth driving many hours to score the best flying conditions to be found. I log a lot of miles in pursuit of that goal. It's not always easy to figure out where the flying is going to be best, especially in the fickle conditions we see between fronts in the wintertime. And of course we all have our own personal criteria for what the best conditions are, whether it's the greatest distance potential, the best scenery, or the most friends to keep us company. Sometimes the best flight might just be a safe launch and landing followed by some cold beverages and warm camaraderie. I know there are other perfectly valid theories people use to figure out where to fly, especially if our flying days and free time are more limited. For some of us, the best flight is always the one five minutes from our house, no matter how challenging the conditions might be. Or it's any flight we can squeeze in during our lunch hour. This winter has been very generous to those of us with the luxury of time to chase conditions around the island. Since we marked the start of the winter XC season with a long Makapuu downranger in early November, we've flown nearly every weird and wintry corner of the island multiple times in the ensuing four months, and we've logged an assortment of long and interesting XC flights, with many pilots improving their personal bests. Yesterday had the makings of another light wind long distance downrange day from the east side. I dutifully packed up and got on the road to Makapuu, only to find myself gripped by a sudden feeling of hesitation halfway there. I hate that feeling! The sensor at Kahana had just kicked in like a switch had been thrown. The flow was rather easterly but it seemed like it should be totally workable. Obviously the long downwind flight starting at Makapuu would be the easiest and best chance to score some miles. But what if I could make the upwind route happen, starting at Kahana? I remember how awesome that felt on a couple of super light northeasterly days last year. That could indeed be a better flight. Even making it partway would be a rare accomplishment. And it would be an easy return trip as a bonus! Or was I just talking myself out of the drive? The Sunday traffic was crawling in Temple Valley and Waimanalo would be just as bad. The range was sparkling and beautiful with high sparse clouds peppered above. I knew everyone and their dog would be at Makapuu. And I was already halfway there. Oh, this indecision was killing me. What if everyone and their dog flew downrange from Makapuu and I just got a crappy sledder at Kahana. That's happened a very few painful times I can remember. But what if I could do something amazing and creative, like jump from Kahana through Boogaland to start an epic upwind mission? It's always fun to imagine pulling into sight at Makapuu out of nowhere! Enough hand wringing and rationalization! I turned around to seek my fortune alone in the least likely spot. But somehow I convinced myself I was doing the right thing. And when I parked at Kahana the flow at the LZ seemed perfect. So I probably wouldn't be getting a sledder. Maybe not any kind of best flight but not a sledder! It felt pretty strong and easterly on launch. Hmmm. Probably not going to be able to cross the bay to start an upwind mission. It might really be Booga or bust! 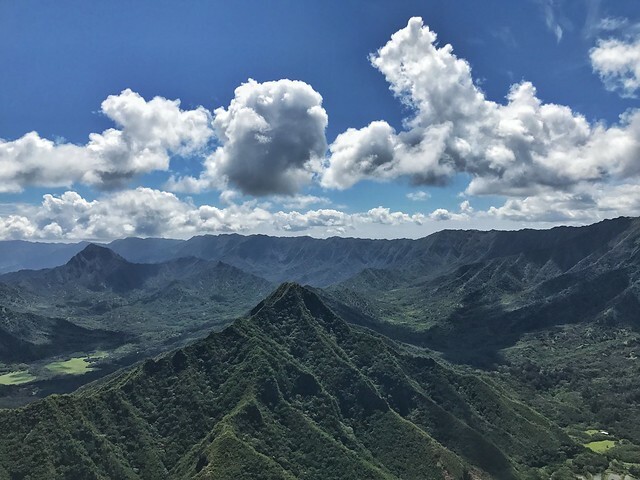 Soon after launching I sprang above Puu Piei and caught a couple of amazing rough thermals to cloudbase just over 3,600 feet, pretty deep over Kahana Valley. A rare spot to be that high, but the super easterly flow was working that way. In a calm moment I took a quick video because I didn't think a picture would do justice to the sweeping views around me. I drifted downwind and started figuring out the strong and snappy thermals above Sacred Falls, to see if I could connect the dots through Boogaland. The flow was definitely easterly or maybe even a bit southeasterly but it didn't seem like too strong of a headwind. But by this time I noticed the clouds were starting to drop and fill in a bit. I could see clouds draping over Puu Konahuanui at the Pali. I ventured back along the forbidding green wall of Boogaland a few times trying to sniff out a good line. Even if the full trip along the range was blocked, maybe I could at least fly the inner line back to Kahana for my first time. Only a few people have done that before and I really want to figure it out. But each of my tries was met with unrelenting sink, and I had to retreat and regroup over Sacred Falls. Finally I took a nice high outside line back to Kahana because I knew Marc was just arriving, and I was eager to topland and take a break. I'd only been in the air for an hour but I was exhausted from the thermaling and my hands were numb from gripping my brake handles like a madman! Marc and I launched for the second session and sniffed out some nice thermals around Puu Piei to get us high enough to drift over to Punaluu. Meanwhile, we didn't know it but Kevin and Duck were hiking up to join us. Turns out they got some pretty southeasterly flow just after we left Kahana and they struggled for quite a while to make it work. Kevin scratched like a beast and dug out in a lucky thermal from below low launch, to slowly work his way up for a nice flight in those strange southeasterly conditions. Duck made a valiant effort and scratched his way up to the rock but couldn't climb higher, and finally he threw in the towel. Marc and I arrived at Punaluu just in time to feel a distinct change in the character of the airmass there. Suddenly the cloud base was lower on all sides, and there was smooth lift everywhere around us. I found myself still doggedly thermaling in light ubiquitous lift and finally realized I should just stop turning and let myself drift slowly higher. We floated easily up above three grand, topping out around 3,500 feet, and the views and the cloudscapes were as spectacular as any day I can remember up there. I always feel super lucky to fly this high above my valley and the Sacred Falls headwaters on days like this, surrounded by cloud castles and sunshine! I started to take some more video clips with my phone. I had the sneaky feeling that this might be a flight worth documenting in some detail. By this time it was crystal clear that no epic long flights were going to happen between Kahana and Makapuu. But I still wanted to make some distance. It was going to be very hard to bring ourselves to leave this gorgeous cloud castle playground behind, but I am always excited to experiment with long downwind glides. It's the last important tool in the toolbox for XC pilots! I mentioned to Marc that it might be a good day for him to make his first trip to the golf course. He's a big golf nut, so I figured he'd be interested. He asked, which one? Royal Hawaiian? Pali? Ha ha. From three grand we would probably have a nice downwind glide to Kahuku golf course, the first golf course route we started to figure out a few years back. Normally people learn to fly downwind in progressive measures, trying out each LZ on successive flights along the way, but Marc is apparently not a normal person, and he's been crushing the XC flights this winter on his new glider. And now he's got a magical new pod harness! I texted Duck on the off chance he might be home and available to retrieve us. He responded with a brief story of his challenging flying day, and he included the magic words: go as far as you want. Yes! So we tanked up and headed downwind, looking for the lifty line that would guarantee a landing in mythical Kahuku. Along the way I pointed out all the different good places to land, and a few not so good ones, but hopefully we wouldn't need any of them! I thought Marc was looking low before we even reached Laie Point, but he actually made some turns there to climb a bit, and continued on looking somewhat better. So now I thought he would have a good line to Hukilau, but no further. It took us many years of downwind flying to figure out the line across Laie to Hukilau and I was pretty sure that was going to be Marc's destination today. Hopefully he'd be stoked with that personal best even if it wasn't the golf course. Then I watched as he just maintained his heading to blaze past Hukilau without stopping. I winced to see him buzz super low over densely forested Malaekahana State Park. For sure he'd be landing on the thin strip of beach just on the other side. Already a personal best. But no. He scraped his way along the entire tree line fringing the bay, nearing his shadow at the end of the beach. Now that is actually a great place to land. And he was looking to me like he'd just barely make it there. But then in one last crazy move, he zigged across the camping area towards the ranch. Holy crap, now he was shooting downwind so low, he was surely going to hook a foot on power lines or trees or fences! Somehow he found a line right between all those obstacles, and I grimaced in disbelief as he skated between the last few trees and hooked a perfect upwind landing on the golf course beach, in front of the fourth tee on the tall dune. What a nerve wracking finish. And I had taken video clips of the whole crazy line with my phone! We folded up and then searched out a couple of lucky lost golf balls in the Naupaka. Duck met us at the clubhouse with a cooler of cold refreshments and we debriefed each other on every aspect of our flights over the ten mile return trip. Not to mention a little more debriefing with Kevin when we got back. So was this the best possible flight of the day? I'm really not sure, but it felt like it at the time, and maybe that's all that matters. It was definitely one of Marc's best flights ever, and his personal best in that direction from Kahana. I look forward to hearing (or reading...?) stories of other best flights from yesterday! In the meantime I hope I haven't bored anyone with such a long tale. I put my clips together into a video, the first one I've made in a year. I'm pleased enough with the result that I thought it was worth scratching out a story to go with it! Excellent flying and great to see a return of your story telling. Makapuu had promise, but as I flew down to Pu'u'okona in the super east flow, I found cloudbase was barely over 2000'. Beyond the Pali the cloudbase was clearly higher and I just needed to get there. But with the cloudbase so low and it being very east, my prospects of staying up on the east faces to the Pali seemed iffy. While it seemed possible, I didn't want to stick my Zeno, on its maiden flight, into a tree on the way. So I pulled tail and gunned the Zeno back into the leeside headwind back to Makapuu. It made it no problem, so I am happy about the gliders' performance and am looking forward to some long flights in the future. Plus my wife was happy I would be back on time for our social obligations. Lots of people flew on a beautiful Makapuu Sunday where you could thermal to 2000' over the main ridge. Nice. With a tear in my eye, wishing I was there, I thank you for your story. Made me remember why I love to fly. The video was spectacular, of course Marc's wing colors really made it pop....gotta love purple. Congrats Marc on your epic flight and the best thing is you gotta video of it, just in case you ever forget, haha. Thanks again Alex, it was a tale worth waiting for. You know how much I appreciate a good story.